I keep hoping for a dry weekend, so that we can work on clearing the garden plot and start planning ahead what to grow, except its been another drizzly wet weekend. Yesterday we decided to explore the East End of the city this time. So please join me, I hope you enjoy the tour. We've been to the Peoples Palace and Winter Garden before, but I recall parts of it being closed due to restoration work. The Peoples Palace opened in 1898. 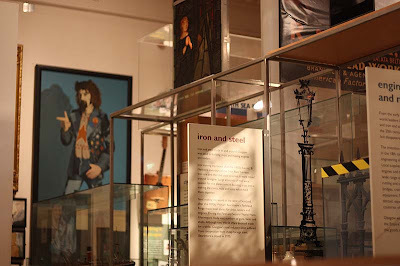 These days it is museum of social history and showcases stories of the people from 1750 to the present time. 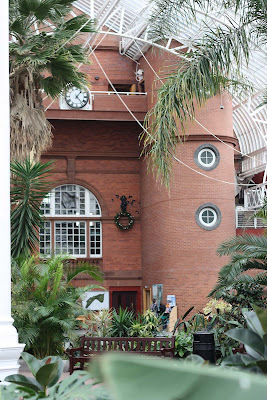 First stop was the Winter gardens, an elegant Victorian glasshouse where you can chill out among the tropical and exotic plants. 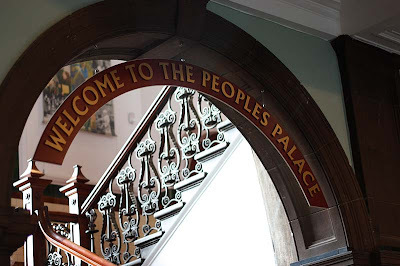 It is a peoples museum, but you'd be surprised how many people show lack of consideration to 'other people', hence the need for this very necessary sign. It is a reminder of the reality of what some fellow human beings have to face in some parts of the city, even the country as these incidences do happen, quite often I am sorry to say. I loved these pieces of metal work which depicted the story of Saint Mungo, the founder of the city of Glasgow. Saint Mungo is said to be an immigrant himself, a refugee who arrived in Glasgow in about 540 CE. Saint Mungo is said to have performed four religious miracles in Glasgow. These are all represented in the city's coat of arms. The following verse is used to remember these: Here's the bird that never flew, Here's the tree that never grew, Here's the bell that never rang, Here's the fish that never swam. 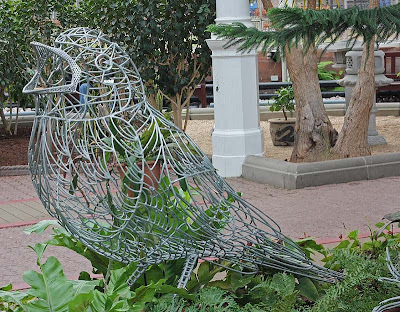 The verse refers to the bird (see below) Saint Mungo restored life to the pet robin. The tree (you can just about see it int he above photo) Saint Mungo had been left in charge of a fire in Saint Serf's monastery. He fell asleep and the fire went out. So he took some branches from a tree and relighted the fire. The bell (see above photo) is thought to have been brought from Rome by Saint Mungo. It was said to have been used in services and to mourn the deceased. 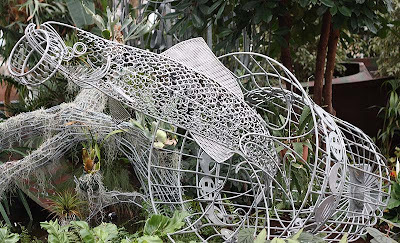 And finally the fish refers to the story about a Queen who was suspected of infidelity by her husband. The King demanded to see her ring, which she had given to her lover and the King had subsequently thrown into the River Clyde. Faced with execution she appealed for help to Saint Mungo, who ordered a messenger to catch a fish in the river. On cutting open the fish, the ring was miraculously found inside, which allowed to Queen to clear her name. Source. 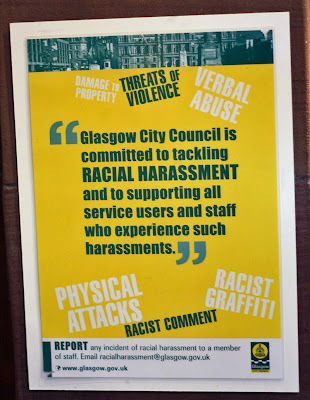 You will see these symbols all over Glasgow city. 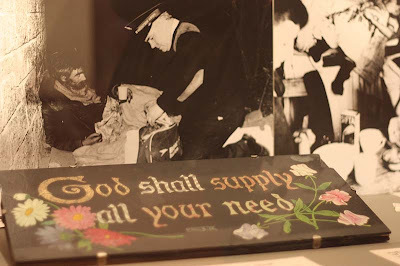 Glasgow's motto Let Glasgow flourish is also inspired from St Mungo's original sermon. 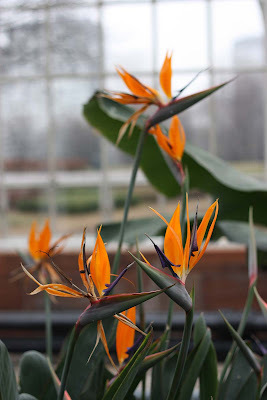 Graceful Birds of Paradise. 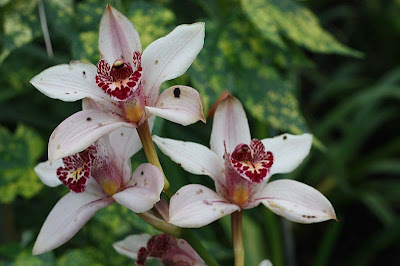 I've only ever seen them growing once in my life when I visited the state of California and many of the gardens in the affluent areas had them growing in their front yard. A truly beautiful sight. After a gentle wander through the gardens and being hit now and again by water leeks from above, we stopped at the cafe for a coffee and a slice of apple pie which was served cold and extremely disappointing. 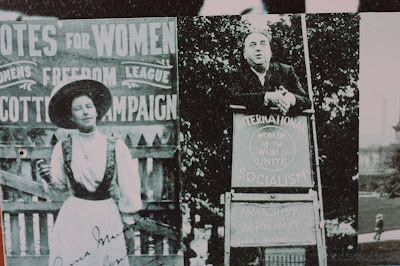 From the green lush of the gardens into the dark days of history. 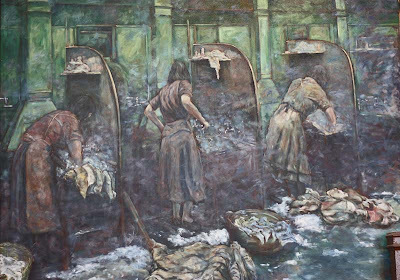 A painting depicting 'the steamie' and hard working washer women. I am so grateful for the washing machine. The term 'steamie' is still used by a lot of Glaswegians, these days though it means 'gossip room', well that's what I've been told. 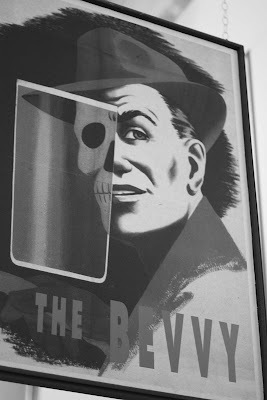 The bevvy a UK slang for beverage and in this context the demon drink. 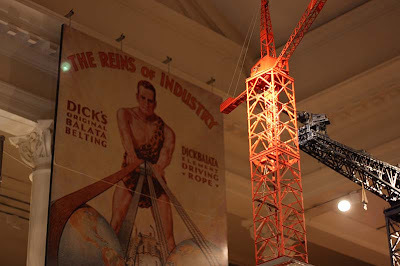 The reigns of industry. But before we got to explore this, we were entranced by a series of paintings on the ceilings dome of the museum. 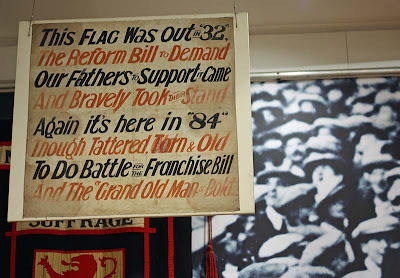 The eight panels mark the 200th anniversary of the Calton weavers Massacre of 1787 and depict the history of Glasgow's workers from that day to the present. 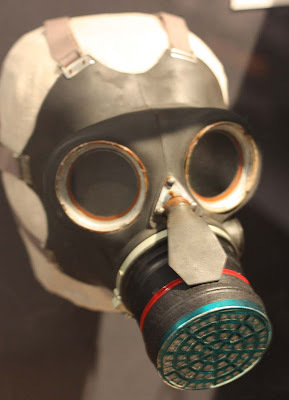 Unfortunately it was very difficult to capture these powerful and vivid paintings which were created by artist Ken Currie, so that is something for you to check out in person should you ever visit the Museum. 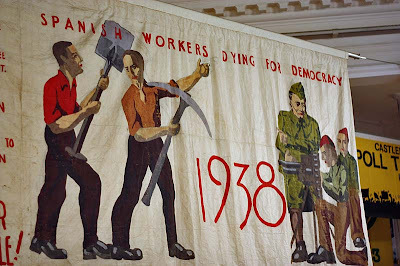 This hanging below depicts the International Brigades fighting in the Spanish Civil War. From the serious to the light-hearted. 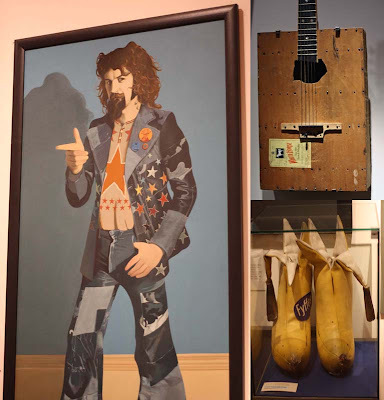 One of Scotlands well known and much loved comedians Billy Connolly, his guitar made from a wooden whiskey box and those famous Big Banana Boots. After our tour of the Museum and the gardens, we strolled over to the Barra Market. The Barras is a major street and indoor weekend market in the East End. The term barra is Glaswegian dialect for 'barrow', relating to the market's early years, where traders sold their wares from handcarts. This specific painting at the museum is a pretty good depiction of the hustle and bustle of the market, full of character and 'characters', but its not a place you want to go snappy with the camera. Just take my word for it. This photo was also taken at the museum and not the original, distinctive animated neon sign found on the front of the Barrowland building. 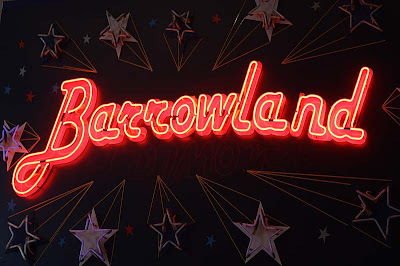 The Barrowlands originally known as The Barrowland Ballroom was a major dance hall, nowadays thought it is used primarily as a concert venue. I've seen a handful of bands there. If your an Amy Macdonald fan like me, on her album This is the life has a song where she mentions the Barrowlands. Heres a link to the song if you'd not heard it. Okay all this walking had got to me and my little feet wanted a rest, plus my belly was rumbling too. So we stopped at The 13th Note, perhaps my favourite vegetarian and vegan eatery in Glasgow. D had the veggie burger with spiced potato chips. I had something far more experimental. 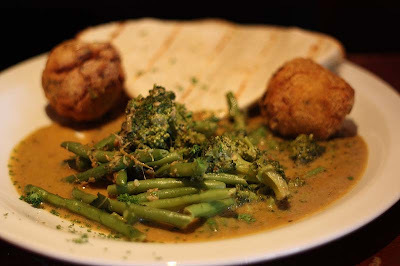 Thai green curry with risotto balls served with a tortilla flatbread. It was a good portion, though the combo and clash of the flavours was interesting. After being fed and watered, we had one more place to visit. Its Fairtrade fortnight and the Royal Concert Hall was hosting The Fair Trade Experience. I went last year and picked up a few bits and pieces, but not so much this time. 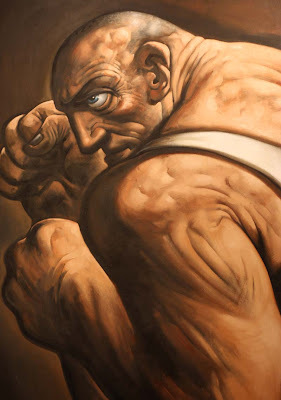 Finally on our way out, D an admirer of the works of Peter Howson's snapped this picture of a boxer in the hallway of the building. Look at the muscles on that man. I wonder if he can carry me home?! Hadn't heard the term steamie used in that connection. In Quebec a steamie is a hot dog.All-dressed (Montreal Style) : This hotdog, nicknamed a 'steamé', is topped with mustard, chopped onion, and sauerkraut. AND you must have poutine with it! We are going to Scotland in May and will either be based in Glasgow or more likely Edinburgh. We have been to Glasgow before but your description makes me want to visit the Museum and the Barras. 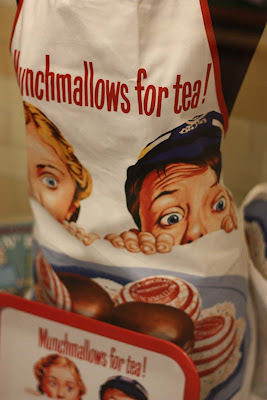 I am adding this to my Scotland itinerary right now! Also will have a vegetarian friend with us so the recommendation for the restaurant is perfect. Oh, the Winter Gardens is so beautiful! Thank you so much for sharing! Very interesting! The food looks soooo delicious! It looks like you had a great day out. It's fun to explore the area where you live, there's often places where you haven't been before, or things you didn't know about the place. What a lovely tour, Mango. Very interesting, and your stop to eat looks delicious. Thanks for sharing what the term 'steamie' means in Quebec a steamie. I really found it interesting. I don't know what 'poutine' is though? Please can you enlighten me? I am so glad you found this entry interesting. 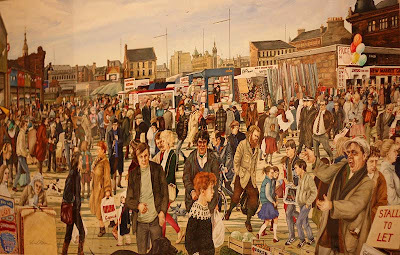 The Barras is not a place where you see tourists! 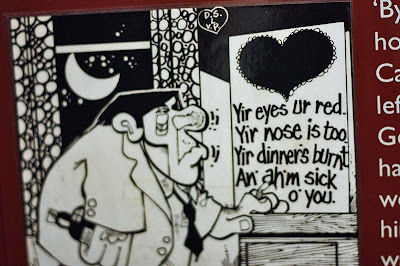 but I recommend it for sure, it will give you a peek into a bit of real Glaswegian life! 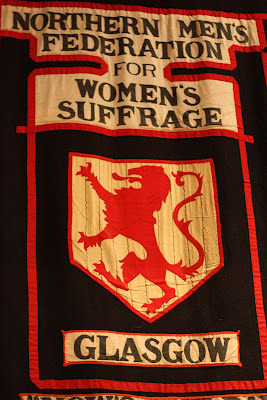 You may also be interested in the entry below when I visted another museum in the city. I do hope the weather is kind for you in May. 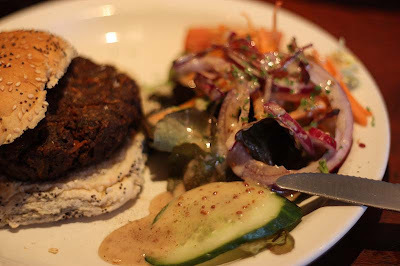 PS I am hoping to write an entry of some Vegeterian and vegan eateries in Glasgow, so please do come back again to check them out. Thanks for coming by Catherine. You are so welcome Lottie. Pam, I am so glad you enjoyed the pictures. Thank you so much Olde Common Scents. I totally agree with you Jo. Jackie, that's interesting. When I order an all-dressed hot dog (in Montreal), it comes with mustard and coleslaw. Then again, I only buy a steamé when I'm at Lafleur, so maybe it's their quirk? I guess thats the thing abot food, people and places have slightly different variations. The poutine reminds me of something many young Glasgwegians eat here, especially after a night out. Its known as 'Curry,chips and cheese'. Its essentially a curry sauce (made from tomato sauce with curry powder) poured over potato chips and then topped with cheese. I hand on heart have not had this yet, and i've been living in the West of Scotland for over 10 years now.